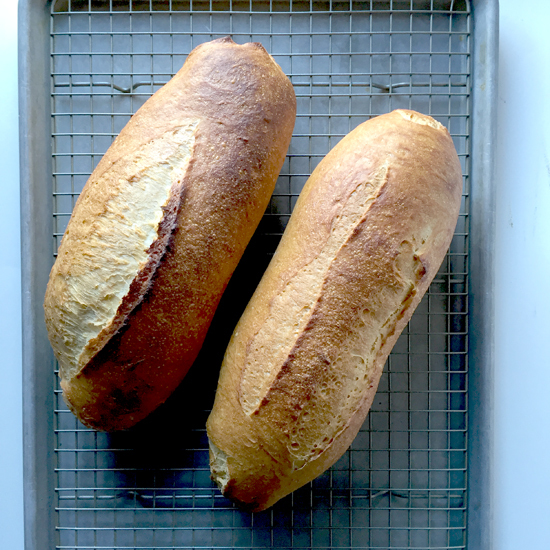 Can you hear the angels singing for these homemade French batards? Sooo, I'm finally getting around to posting these loaves that I made a week ago. 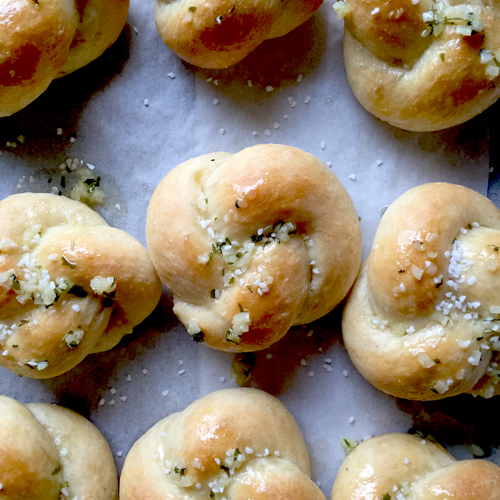 I can't even tell you how excited I was about being able to make these in my own oven. 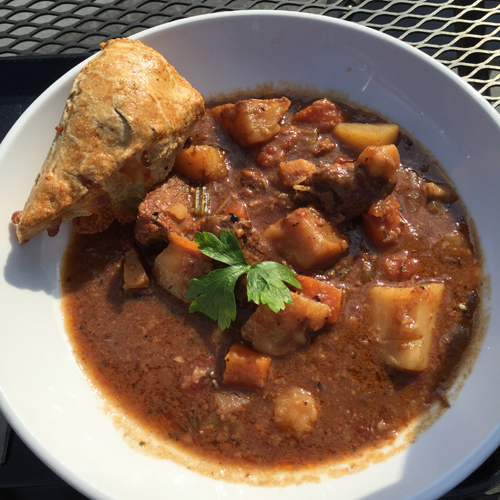 It was crisp and chewy on the outside and soft and tender on the inside. Mmm. I did not let these loaves rise quite long enough. They probably could have taken another 15-20 minutes of rising, but I had to get to my son's soccer game, so they had to go in the oven early. They still made my heart sing. This post has a ton of pictures at the end, along with a few videos, my favorite being the crackling loaves as they cool (you may need to turn up your volume). I wanted to show as much as I could the step by step process. 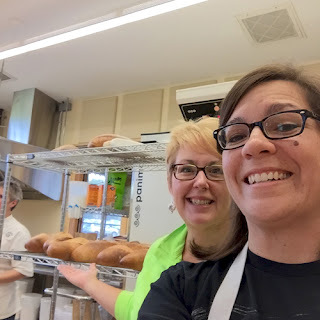 Some of the pics of the turning stage were shot in different lighting because I had to actually carry my dough with me to church and do the mid-rise folding in our church kitchen. Yeah, some people saw me and laughed--but in a very loving way. Again, I am thankful to King Arthur Flour and their Baking Education Center for teaching me how to make these loaves at home. Now I just need to find another half day to make these where I don't have to worry about any kind of time crunch. Next time, they will be perfect. I'm so excited. 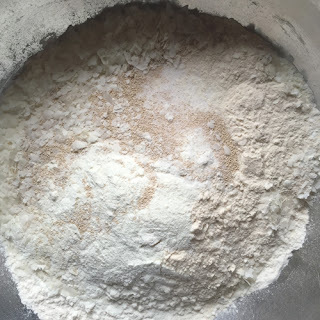 For the Poolish: The night before you are going to bake your break, combine the 2 cups flour, 1 cup water, and pinch of yeast in a large bowl. Mix until blended. Cover the bowl with plastic wrap. 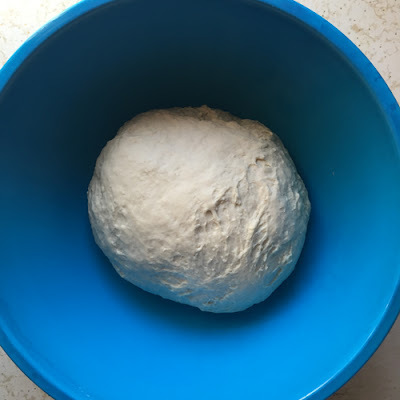 Allow poolish to sit and rise for about 15 hours at room temperature. 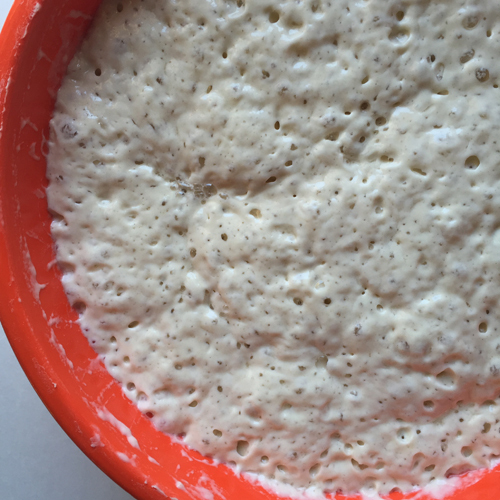 The poolish will be bubbly and batter-like when ready. 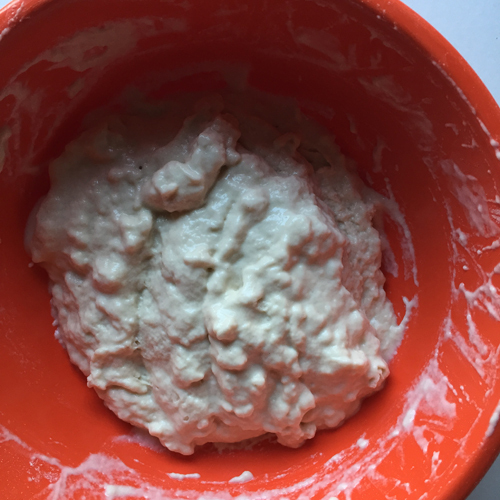 For the Dough: When the poolish is ready, add the flour, water, yeast, and salt. 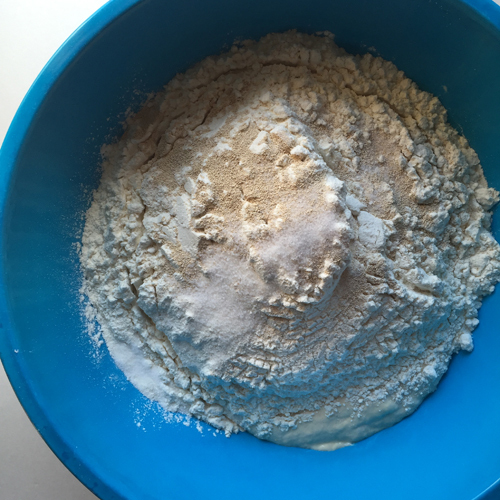 Stir to combine and develop a relatively stiff but sticky dough. Although it's going to be quite sticky, don't add any more flour. Once dough has been cut 5-6 times, use both your hands like lobster claws, to pick up the dough at the top and bottom with only your fingers. Give the dough a quarter turn in your hands, slap the dough onto the work surface and fold the dough in half away from you. (See video below.) Repeat until dough is strong and almost resists being folded. The gluten is as developed as it's going to get at this point. 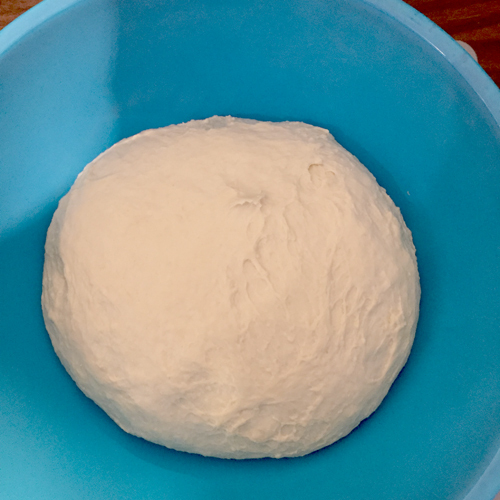 Place dough back into the mixing bowl, seam side down, and cover again with plastic wrap. 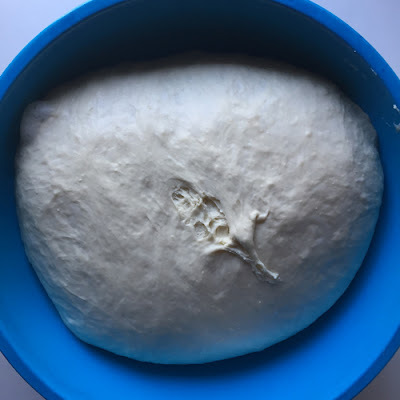 Allow dough to rise for 45 minutes. Then turn the dough out onto a clean work surface. Pick up the top of the dough, stretch about 5-6 inches and fold about 2/3 of the way down the blob of dough. Repeat with bottom and left and right sides of dough. 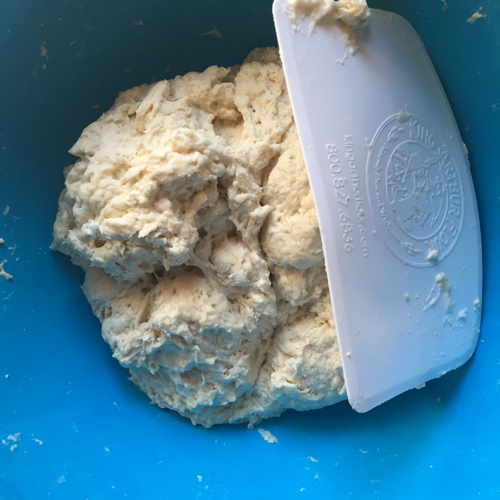 Place folded dough back into the bowl, seam side down, cover with plastic wrap again, and allow to rise another 45 minutes. Preheat oven to 500 degrees Fahrenheit. Either line an upside down baking sheet or pizza peel with parchment, or sprinkle a pizza peel with semolina flour. Set aside. 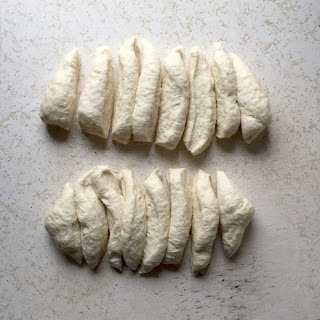 Turn risen dough out onto clean work surface and cut dough in half. 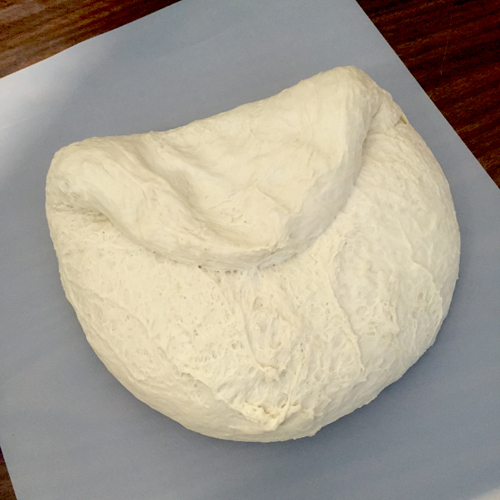 Pre-form dough by pulling the edges up to meet in the middle, forming a sort of pouch that's pinched in the middle. Allow pouches to rest for about 20 minutes. Working with one pouch of dough at a time, gently pull the top of the dough out and fold about 1/3 of the way down the dough. Gently pat the folded portion. 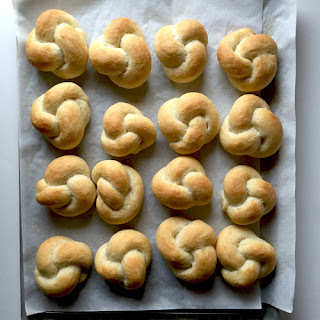 Take the little nubby arms on the left and right of your fold, gently pull away from the ball of dough and fold to the middle, overlapping the arms. Gently pat the folded portion again. 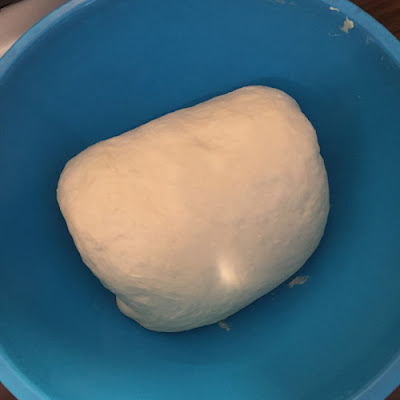 Pick dough up at the top and start rolling it down, sort of folding about halfway down the length of remaining dough (see pics below), and with the heal of your hand, press the seam you just created. 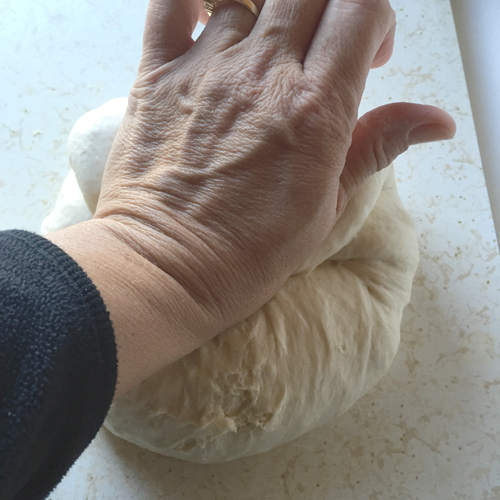 Roll/fold dough again to the bottom edge and seal by pressing firmly with the heals of your hands. 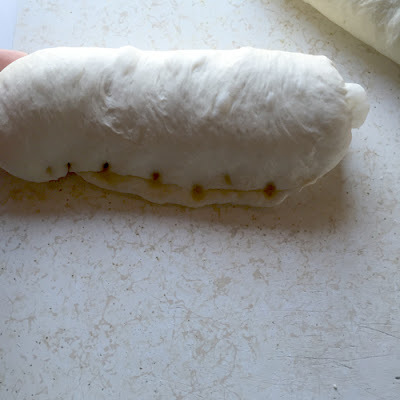 Gently roll dough log, seam side down, back and forth to lengthen slightly and to taper the ends. 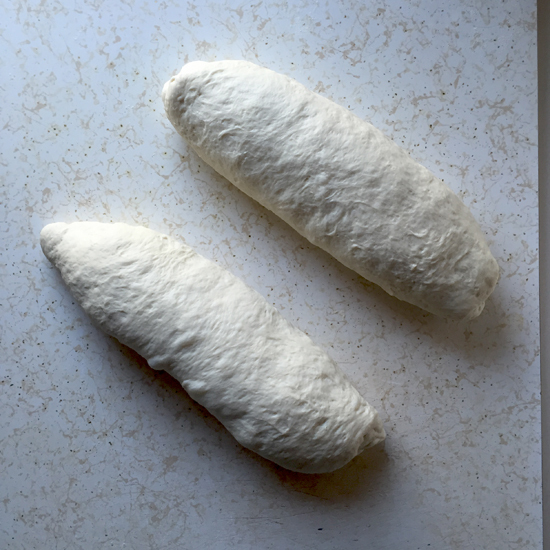 Place formed loaves onto prepared baking sheet/pizza peel, keeping them as far apart as you reasonably can. Allow loaves to rise, covered, until puffy and pillowy, about 30-60 minutes. 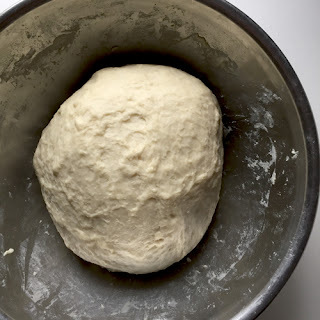 While dough rises, heat a medium pan of water to boiling and place a cast-iron skillet in the bottom of your oven, or on the bottom rack, whatever will be under the baking surface. When loaves have risen, slash each one lengthwise with a razor. Slide loaves onto the baking stone and quickly (and carefully) pour boiling water into the hot cast iron skillet. Close the oven door. Bake at 500 degrees for 5 minutes and then turn the temperature down to 425 degrees Fahrenheit. Bake for another 25 to 30 minutes, or until loaves are crusty and well-browned. 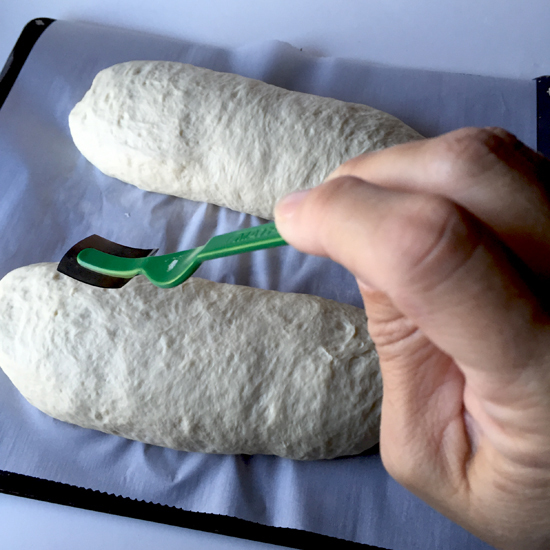 Remove loaves from oven, transfer to cooling racks, and allow to cool before attempting to slice. After an overnight sit the poolish is bubbly and smells amazing. I really should have done the poolish in this bowl, but I forgot about bowl conservation. Next time. At the KAF Baking Education Center we learned to use these handy plastic bowl scrapers to mix the dough. I also forgot that I didn't have to wash the bowl between mixing and rising. Makes a nicer pic though. Dough 45 minutes into rising. Ready to turn out and fold. Fold in all sides. I really don't think it matters in what order. Someone correct me if I'm mistaken. Done folding, ready to cover and rise another 45 minutes. Darn plastic wrap make me tear my beautiful dough. One half of the dough is pre-formed in its pouch shape. I can't even tell you how great this dough feels on my fingers. Rolled over and pressed with heal of hand. Kind of hard to see. Batards are risen and ready for slashing. I hope you can hear the crackling of the crust as it cools. Amazing. The crumb is a little tight, but delicious nonetheless. 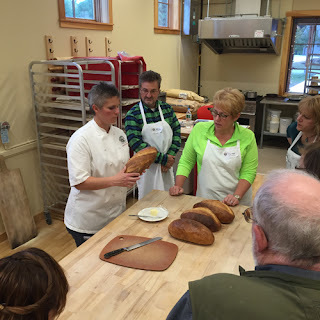 In case you haven't read the five previous posts here, I just got back today from Norwich, Vermont, where I got to spend four days learning how to bake bread at the King Arthur Flour Baking Education Center. I'm trying to sum it all up in my brain, but there is just so much. 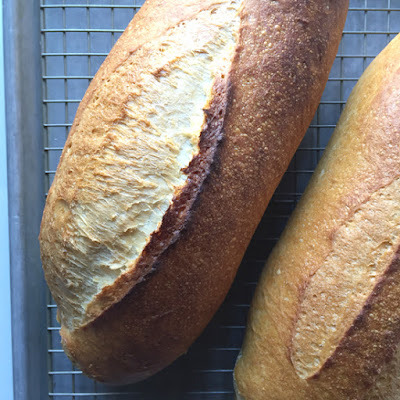 Let me start by saying that the French batards we made yesterday were so incredible, and I'm so excited to try them at home, that I asked my 13-year-old son to start a poolish for me as I Face Timed him last night. As soon as the words, "Measure two cups of flour" came out of my mouth, I remembered that I'd used the very last of my flour right before my trip to make some focaccia for said son to enjoy while I was gone. Shoot. So, I decided to try something that I haven't baked yet in order to practice some of the techniques I learned. Mixing and kneading yeast bread dough by hand is a complete sensory experience--the smells of the yeast and the baking bread, the sight of the dough rising in the bowl and the loaf rising in the oven, the sound of the dough slapping on the counter top as you knead it by hand, the stages of the dough texture culminating in a smooth, cool formed loaf that feels just like a baby's bottom, and then, of course, the taste of freshly baked bread--the chewiness, the crunch of a French bread crust, the distinct slightly salty flavor of wheat bread. It really is one of the best sensory experiences out there. Kneading yeast dough, for the most part, requires a gentle touch. 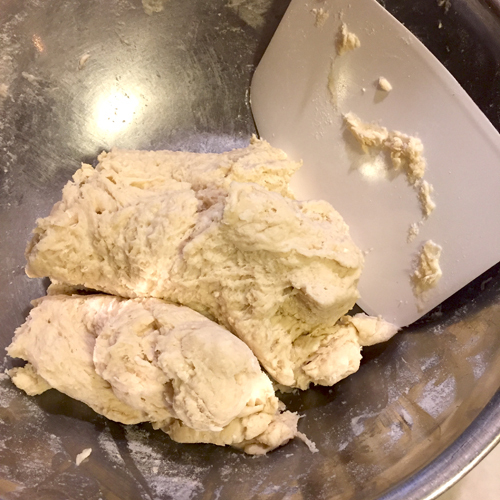 When you man-handle dough too much and exert too much force when kneading, it breaks the delicate skin/gluten fibers, making it sticky, which makes you think you need to add more flour--but most of the time you do NOT need to add that extra flour. Mind blown. It's a good idea to place your ingredients in the bowl in little piles so that you can double check to make sure you have it all in there. And dang it, I've already messed up again. I forgot the salt in these beautiful rolls. Grrr. The instructors at KAF had us use their plastic bowl scraper to do all of our mixing. I've had four of these handy dandy little tools in my drawer for a while, and now I know that I can use them for more than just scraping a bowl. 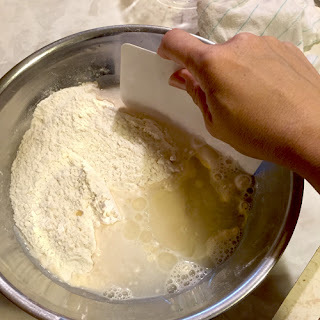 You don't necessarily need to grease the bowl you let your dough rise in, and you can let the dough rise in the same bowl you used to mix the dough. I kind of already knew this, but you don't really need to use water that feels warm. 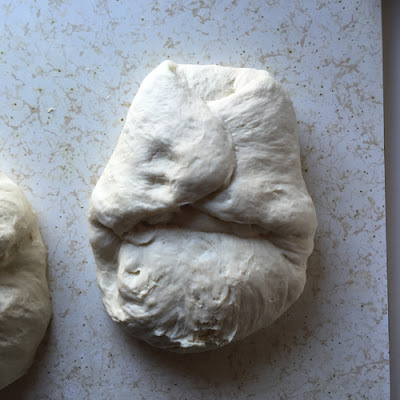 The warmer the water the faster that the dough will rise. Yeast will die, though, at 140 degrees Fahrenheit. 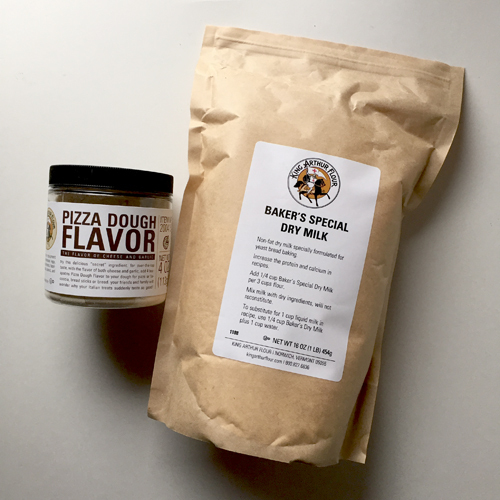 There is this fascinating formula for getting your dough to the perfect temperature. I will only use it for French bread, though, I think. That reminds me, I should start that poolish tonight. Pre-forming your dough is vital to getting a good rise and shape to your finished loaf. 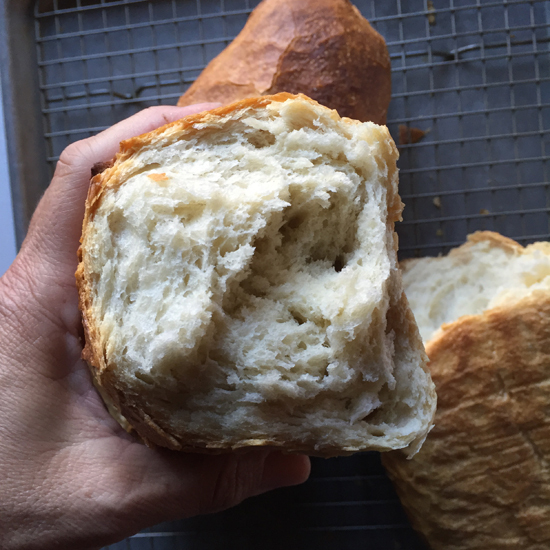 It helps build structure and you want the outside of the loaf to be tight. When scoring a loaf you need to use quick motions to cut the dough correctly and effectively (I still need to practice this one). I know there are more bits of knowledge tucked away in my brain, but those are the ones I have access to at this moment. 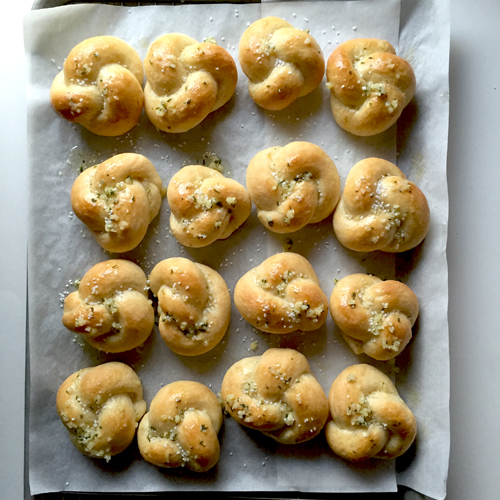 Onto the Garlic Knots recipe! In a large mixing bowl, add the flour, dry milk, mashed potato flakes, sugar, salt, yeast, and pizza dough flavor. With a spoon or plastic bowl scraper, mix all of the dry ingredients. Add the olive oil and water. Mix with a spoon, silicone spatula, or plastic bowl scraper until all dry ingredients are incorporated with the liquid and dough starts to feel strong. Turn out onto a clean flat surface. With a bench knife, cut 2-3 inch pieces of the dough off and scrape into a pile. Repeat 6-8 times. Pile the dough up. With your fingertips and thumbs, pick the dough up at the top and the bottom, give a quarter turn, slap it down, and fold away from you. 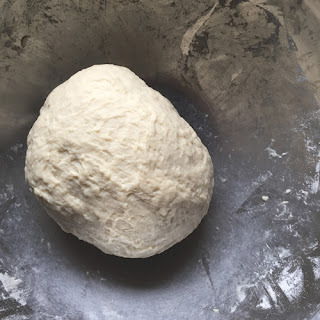 Repeat this over and over until the dough is very strong and hard to fold over. The dough won't get super smooth. Place dough ball back into the mixing bowl and cover with plastic wrap. Set aside and allow to rise until doubled, about one hour. Turn the risen dough out and cut into 16 equal portions. 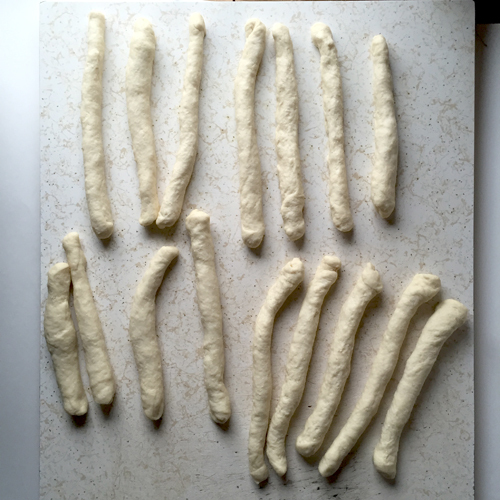 I preformed my dough pieces by flattening each piece and very carefully rolling lengthwise, sealing the edge with the side of my hand/finger. 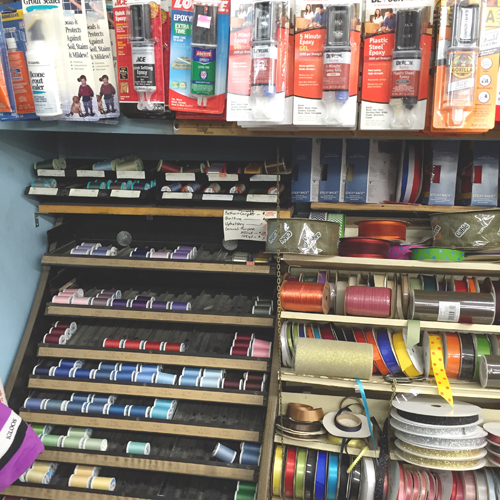 Once all pieces are preformed, roll each to an 11-inch length. Tie each dough rope into a knot, leaving one end slightly longer. Wrap the longer end around to meet the shorter end, and pinch to seal. 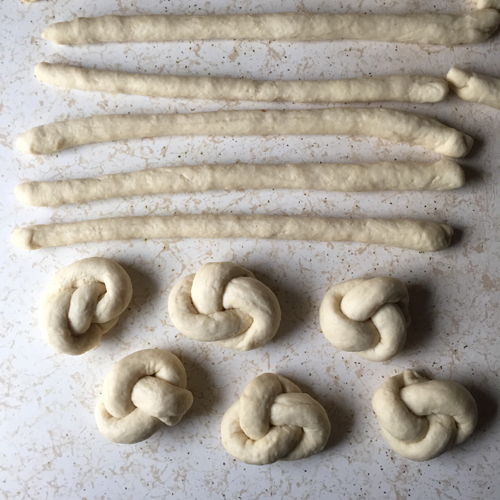 Arrange knot on the parchment lined pan so that the pinched ends are on the bottom. Repeat will all ropes. 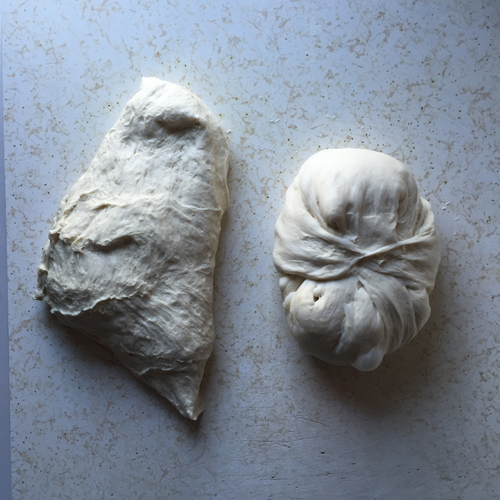 Cover knots with plastic wrap and set aside to rise for about 45 minutes, or until puffy. While dough rises, melt the butter in a small saucepan over medium heat. 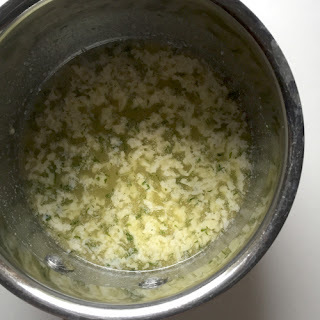 Add garlic and parsley flakes. 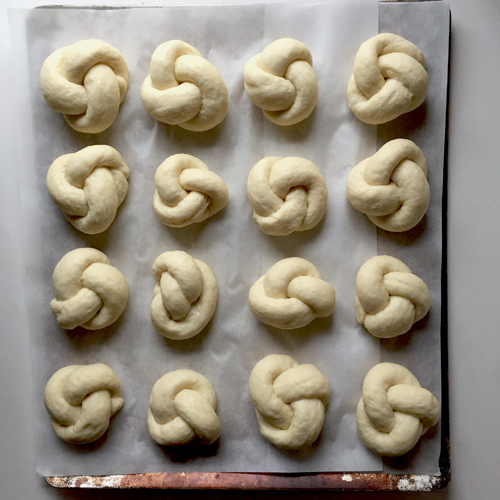 Turn heat off and allow to sit until knots are baked. 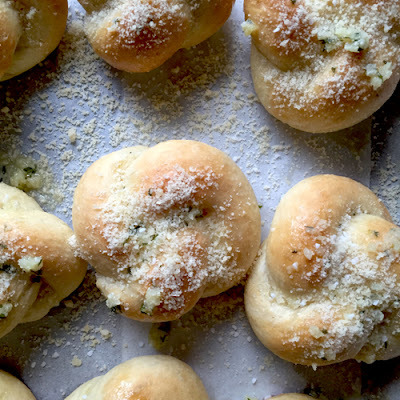 Remove from oven and brush or spoon the garlic butter on top of each roll. Sprinkle with Parmesan cheese, if desired. The Baker's Special Dry Milk makes a tender and fluffy bread. The Pizza Dough Flavor is just a yummy addition. When using the bowl scraper, you actually use it to cut the ingredients together to incorporate. 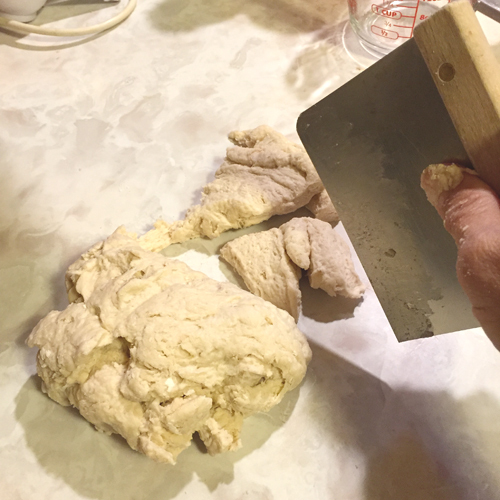 This is the beginning of the kneading process: cutting chunks of dough repeatedly to develop gluten strands & webs. Dough is ready to be covered for the first rise. Hmmm. Maybe I didn't let it completely double. I was on a timeline. Had to pick 13 year old up from wrestling practice. Dough cut into 16 pieces, ready to pre-shape. 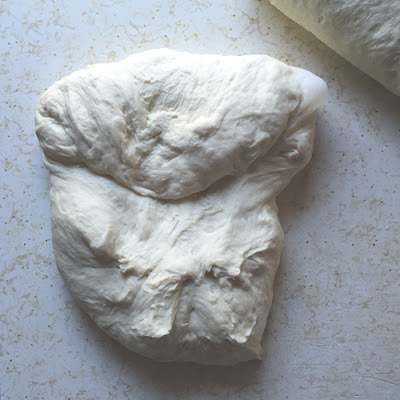 Dough is pre-shaped and ready to be rolled into ropes. Knots are dressed up now with their garlic gems. This is me with Diane showing off some of the loaves we formed. So, here I am at the very end of my dream week in Vermont, taking the four-day "Bread: Principles and Practice" class. Even though I lived it, I still find it hard to believe that I really got to do this. I had such a fantastic time. Every day held new knowledge and new experiences. I met some wonderful people who were in my class and others who work at King Arthur. Today was actually my favorite day in class. 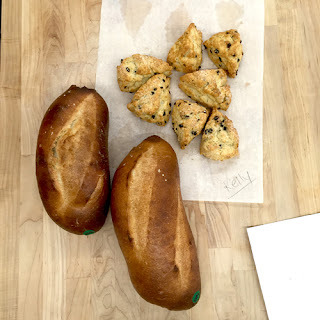 I think it was because we'd pretty much gelled as a group AND we were making the bread I'd most looked forward to making: the French batard, which is really just French bread shaped like a torpedo instead of a baguette. 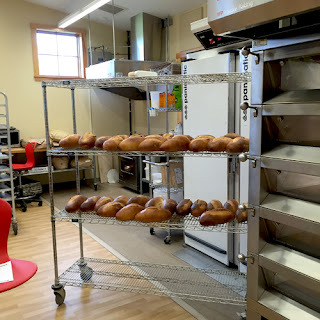 We ended up with an obscene amount of loaves because each student formed 5 loaves (3 from their dough and 2 from our own). We had nearly 50 loaves in there among the 9 of us, plus the instructor's. 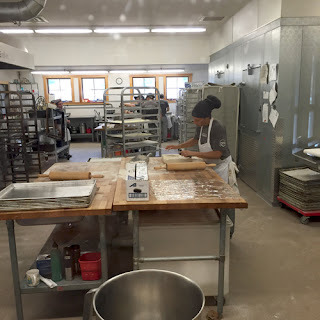 We also learned a new (to us) technique for kneading dough. It involved first cutting the dough into chunks repeatedly and then picking the relatively wet dough up, giving it a quarter turn and simply folding it over onto itself. It was amazing to see and feel the gluten develop and the dough "get stronger." I also learned how important "preforming" the dough is for the ultimate structure of the bread. I mean, those are just a couple of the things I've learned. In the next few weeks I hope to post some of the techniques and recipes that I've taken away from this experience. I just need to remember I have an actual job and other responsibilities. As for the rest of my day, I didn't do a heck of a lot. 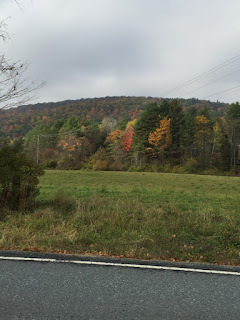 I did some driving around just to see what is out here, and I've concluded that Vermont--at least this part of it--is made up of a lot of small towns. 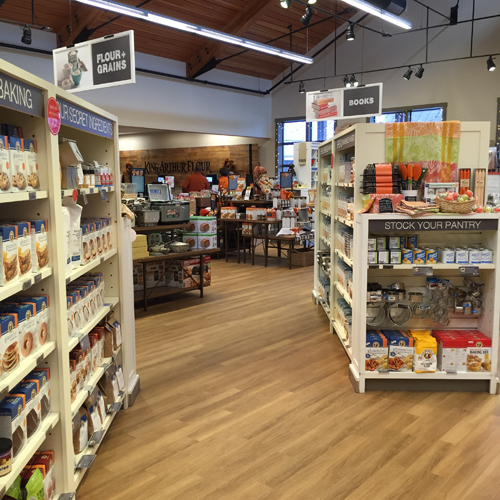 Did you know that there is not one Target store in Vermont? I'm not judging; I just find it surprising. 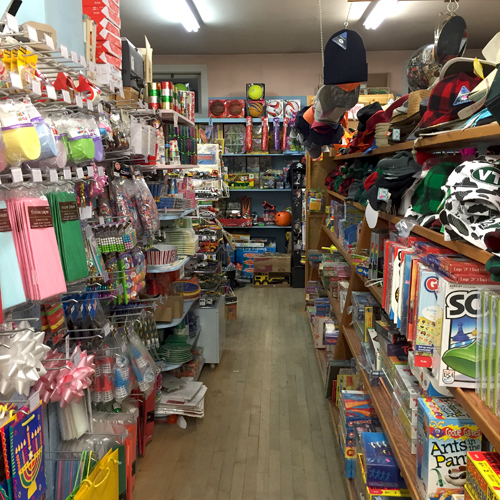 It's actually kind of nice to just see small locally owned businesses everywhere--or large locally owned ones in the case of KAF. At any rate, below are pics from my day. It's been fun, Vermont. Let's try to make this happen again sometime. Dan and Whit's office supplies and kitchen goods, I think. I stopped at the KAF store and bought just a few items before going driving. 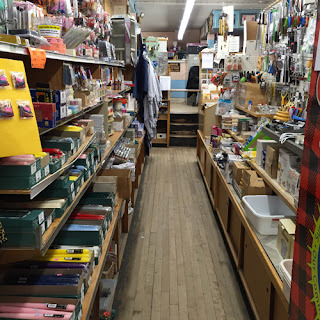 I could stay in here for hours if I let myself. 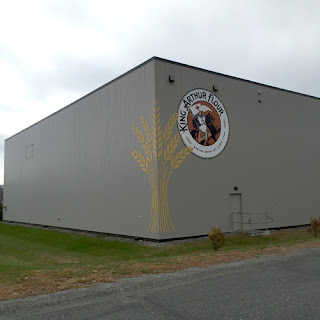 I turned left out of the KAF driveway today and ran across this building. More industrial type things happen here, I think. I think this was in White River Junction. 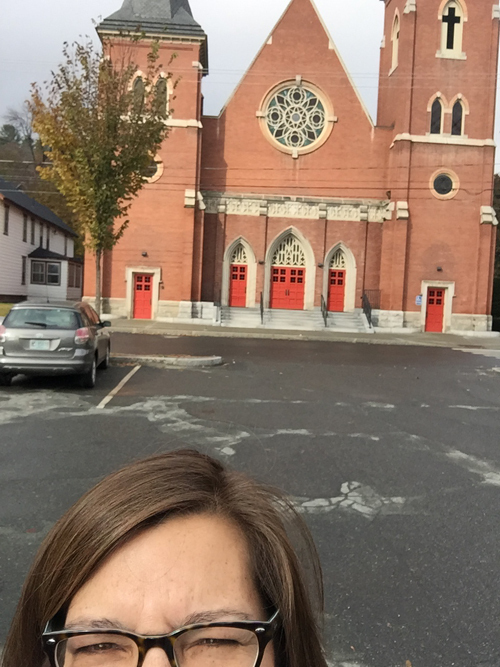 Just a cool looking church. I've already forgotten the name. 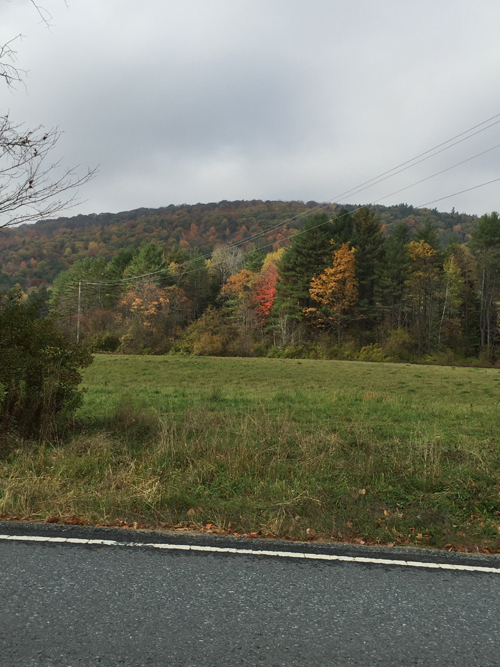 I saw much more beautiful views than this, but I couldn't find a place to stop and I'm terrible at pics on the road. This was a cool drive along a river--I think it's the White River. Don't quote me on that though. 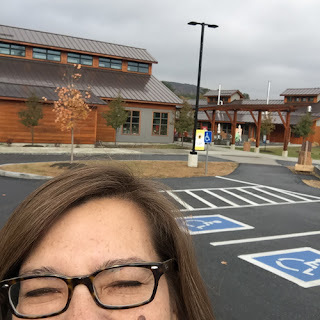 The sun was in my eyes, but I wanted a quick pic of me in front of the KAF Store/Bakery-Cafe/Baking Education Center. This is the new kneading technique I mentioned above. 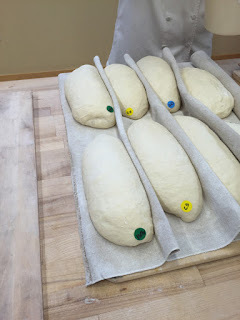 We put stickers on our loaves to ID them. they did not burn up and they stayed stuck to the loaves. So strange. Some of my classmates listening intently to Instructor Jess giving a math lesson on dough temperature. It really was fascinating. This isn't even all of the loaves we made today. This is about 2/3 of them. There were more in the oven to the right. Jess talked to us about the value of slashing our loaves. She cut into different loaves so we could see the difference. Then we got to slather slices of the bread with butter and enjoy. Gosh, this was a great week. 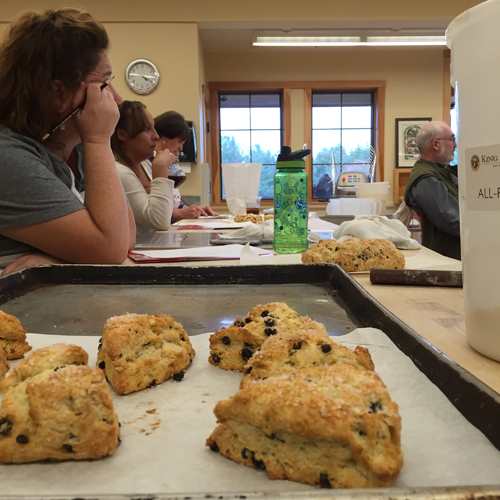 Today we made the French batards and current scones. I literally ate half a loaf of my French bread for dinner. 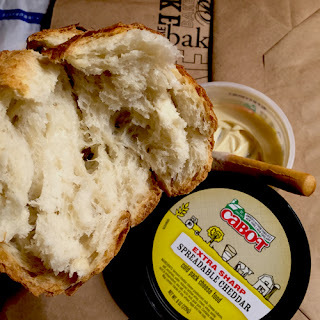 I used this Cabot Extra Sharp Spreadable Cheddar instead of butter because I had it in my little fridge and I can't take it with me back to Iowa. I told you I'd finish that tub of cheese. Isn't that bread absolutely beautiful? That's it. That's all I've got. Thanks for reading about my adventures at King Arthur Flour. If you have the means to take your own KAF adventure, I highly recommend it. You won't be disappointed.